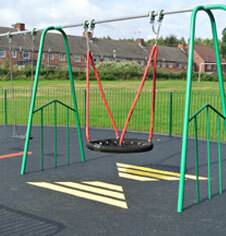 The range of OMG outdoor traditional steel playground equipment is designed for school playgrounds and public recreation and play areas. Featuring robust tubular steel designs this made to recreational specification suitable for public use. Combinations and single and double swings. Contemporary swings and traditional steel park playground slides. Anti vandal construction with colour options. Mounted direct into ground with a 15 year guarantee. 5+ yrs rope and steel playground climbing frame. 5+ yrs orb rope steel playground climbing frame. 5+ yrs star rope steel playground climbing frame. 4+ yrs Traditional steel playground swing sets. 5+ yrs Traditional steel playground slides. 4+ yrs Hanging bucket playground swing set. 4+ yrs steel hanging tyre playground swing set. Playground under ground sound talk tubes.